Increasing interest has risen for nuclear quantum effects (NQE) in the recent past. Indeed, NQE such as proton tunneling and zero point energy often play a crucial role in the properties of hydrogen-containing materials. The standard methods to simulate NQE are based on path integrals. An alternative to these methods is the Quantum Thermal Bath (QTB) : it is based on a Langevin equation where the classical degrees of freedom are coupled to an ensemble of quantum harmonic oscillators. In the classical Langevin equation, the random force is a white noise and fulfills the classical fluctuation-dissipation theorem, while within the QTB formalism, it fulfills the quantum fluctuation-dissipation theorem. 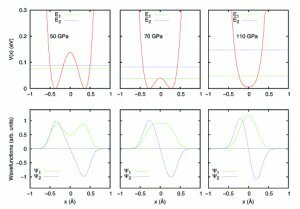 We investigate through simple models the reliability and the limits of the QTB and show that the QTB enables realistic simulations including NQE of condensed-phase systems, generating static and dynamic information such as pair correlation functions and vibrational spectra which can be confronted with experimental results. We show that the QTB is particularly successful in the study of the symmetrization of hydrogen bonds in several systems. Indeed, the difficulty lies in the identification of a precise transition pressure since this phase transition is often blurred by quantum or thermal fluctuations. In high-pressure ice, it depends on the oxygen-oxygen distance but it can be affected by ionic impurities and by the asymmetric environment of hydrogen bonds as in the delta phase of AlOOH. 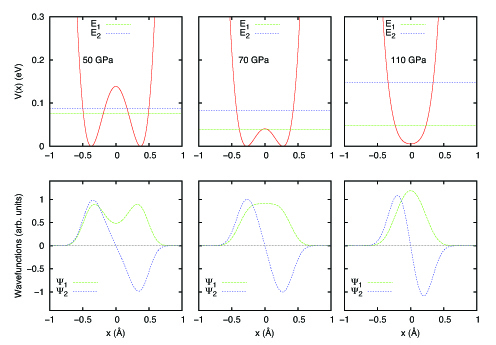 Moreover, by comparing results from QTB and standard ab initio simulations, we are able to disentangle the respective roles of NQE and thermal fluctuations in these phase transitions.